Shirts With Random Triangles: Texas A&M receives class of 2015 commitment from College Station area OLB Riley Garner. 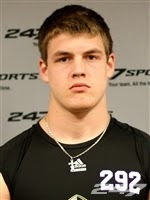 Texas A&M receives class of 2015 commitment from College Station area OLB Riley Garner. Garner attends A&M Consolidated High School in College Station, Tx. He stands 6'2.5", and weighs 210 pounds.